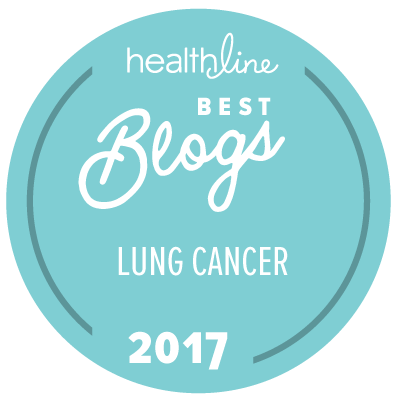 What does it mean to be thankful when you have metastatic lung cancer? Four years ago on Thanksgiving, my extended family gathered for a somewhat somber meal. I had been diagnosed with advanced lung cancer the previous May, and despite aggressive treatment, the cancer had spread further. Although the tumors in my left lung and between my lungs were shrinking due to chemo and radiation, the new mass at the base of my neck was starting to threaten my carotid artery. I could see it growing week by week. I felt flashes of hope mingled with panic, anger and regret. Lung cancer is the biggest cancer killer for both men and women and the survival rate for metastatic disease is less than 5 percent. My presence at future family gatherings was far from assured. This year, I am immensely grateful to have seen three more Thanksgivings and to have no evidence of disease for three years and counting. This entry was posted in Death and Dying, Lung Cancer, Patient Advocacy, The Bright Side and tagged gratitude, metastatic cancer, Thanksgiving. Bookmark the permalink. I am so happy to hear this. Its me Kathy Hanley in Florida, I have beat lung cancer 3 times and it spread to my brain and I beat that also….since 2/2012 when I was first diagnosed with Adneo Carcinoma …..like you we were devastated. I know God is not done with us and we are still here…lets keep up what we are doing in helping others. We are here for a reason. I am feeling the best today than I have in 3 years…Praise God for this. I pray for all the others who are sick and wish for them the same. Not sure why some survive and others don’t. I know you have to have a fighting attitude. A positive attitude also is very important. I know it is hard when you are feeling sick. But we must try and we must never stop fighting this beast. May God Bless you and keep you here for the next 20 years. Have a Merry Christmas…..I now sing a song….